Brabantia is helping to turn the tide on plastic pollution by signing a pledge with Dutch water bottle brand Dopper to go PET-free, introducing re-usable water bottles to its 1,000 staff around the globe. 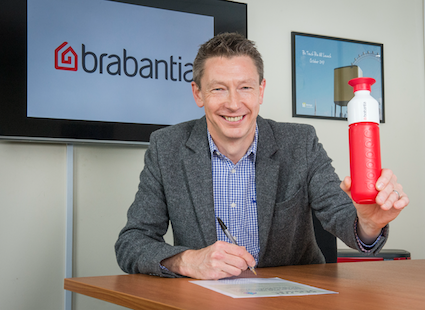 To encourage staff to embrace a lifestyle free of single-use plastic water bottles, all 58 Brabantia employees at its UK Headquarters in Nailsea have been given a reusable Dopper bottle. This new company-wide initiative supports Brabantia’s vision to help reduce the eight million tons of plastic waste that ends up in the world’s oceans every year, much of which consists of single-use plastic (PET) bottles. This partnership with Dopper reinforces Brabantia’s sustainability credentials. At the very heart of its production process Brabantia designs recyclability into all its products and supports people and organisations in making a difference in the world. Partnerships include working alongside WeForest in tree planting to reduce global warming and The Ocean Cleanup in its mission to rid the world’s oceans of plastic waste. Its latest initiative is a collaboration with The Hunger Project, for every Brabantia storage jar sold it supports the charity by funding the training of one person.